Most modern guitars have a tuning key peg hole of 3/8” (10mm). Vintage tuning keys are typically around 1/4” (8mm). These adaptation conversion bushings provide the solution offering the opportunity to use smaller style vintage sized tuners even if you have the bigger peghole. Be sure to check your measurements carefully to see if these will work for your set-up. 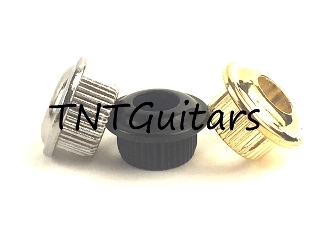 We make it easy to add a single bushing to complete your set if you have a 7 String Guitar. INSTRUCTIONS FOR INSTALLATION ARE NOT INCLUDED. Depending on your current set-up, installation may require extra care and accuracy. We do not provide technical or any other type of support for installation, configuration, modification, or use of this item. Do not purchase if you are unsure of your ability to successfully complete installation.